Here at B.T.J.’s Jungle of West Islip, New York – your one-stop pet shop – we offer a fully stocked cat supply department dedicated to offering all of the cat supplies your kitty could possibly need, from high-quality cat food and supplements for every stage of your cat’s life and delicious cat treats for your precious kitty to comfy beds, sturdy scratching posts, fun toys and a range of top-notch brands of kitty litter. Do you need to bring your cat from one place to another as you move? Or you need to transport your kitty to the groomer or to the vet’s office? Or perhaps you’re planning to travel with your cat? No problem. Pick your favorite travel option for kitty from our wide range of cat carriers. Maybe you want to give your cat its very own home inside your own? Or perhaps provide shelter to an outdoor cat? At B.T.J.’s Jungle, we offer a wide variety of cat houses. The houses can be bought as is or can be altered and customized however you’d like to meet your needs, as well as your cat’s needs. 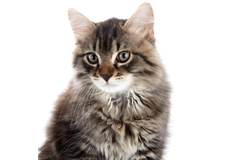 We also offer top-of-the-line cat food brands. We pride ourselves on carrying only the healthiest brands available on the market. Keep your cat active, lively and strong and make sure they receive the essential vitamins they need with Vets Choice Holistic Health Extension and Wellness Natural Food, two of our top holistic brands of cat food. Worried about fleas and ticks? At B.T.J.’s you can choose from an assortment of flea and tick prevention products for cats that include topical solutions, collars, sprays, tablets and oral solutions. We recommend Frontline and Advantage. We’re proud to offer only the best cat supplies on Long Island. However, if you’re looking for a new, furry, four-footed addition to your home, B.T.J.’s can also help. Our locally bred kittens are checked by local veterinarians to ensure they stay up to date on their shots and other important health measures such as deworming. So whether you’re looking for cat supplies or looking for an adorable little kitten, you can be sure B.T.J.’s Jungle, your local pet shop, is sure to have it! Come in and visit us at our convenient location in West Islip, give us a call at 631-587-8191 or fill out the convenient contact form on our website. We look forward to seeing you soon!